A view from the cycle path: Joining in with the mass. Just how much do the Dutch cycle, and why do they do it ? Joining in with the mass. Just how much do the Dutch cycle, and why do they do it ? Use of different transport modes by time of day (in millions of journeys). Dutch people cycle a lot. Of course there is more cycling in the summer than in the autumn and winter. But cycling rates also vary between days of the week. On an average working day, 5 million people make an average of 14 million cycle journeys. Monday and Thursday are the top days with a million more journeys than on the other days of the week. On Saturday, 11.5 million cycle journeys are made, and on Sunday 6.5 million. In the day, 5 million cyclists have made around 14 million cycle journeys. enabled in part by well designed complex intersections. The scale of cycling in the Netherlands is quite phenomenal. If you go out, at any time of the day or night, you're not unusual, but are joining with a mass of other cyclists making their journeys. It's impossible to travel far on a bike without seeing other cyclists. I don't think I've ever made it further than 200 metres from my home (in a 100 m long cul-de-sac) before seeing at least one bike. Riding a bike is not in any way a political statement. It's just normal. The figures above are national figures, applying to the whole country. The Netherlands has a population of 16 million people. That's just twice the population of London or New York. However, the cycling rate of the country as a whole is far higher than that of cities in other countries. By comparison, treating the country as a "city", the people here are spread out at a remarkably low density of just 400 per square kilometre, vs. 4800 per square kilometre in London or 10000 people per square kilometre in New York. The difference comes down to infrastructure which invites you to cycle. Cycling is not a difficult thing to decide to do in the Netherlands. It comes naturally because cycling is so convenient and so safe. 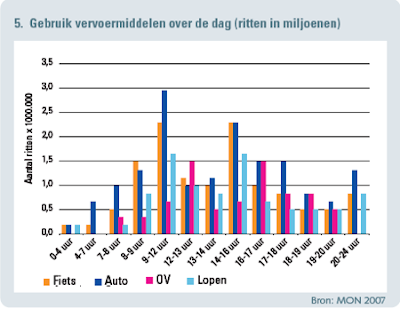 This high percentage of all trips by bike is only possible because almost everyone cycles in the Netherlands. If only a limited subset of the population ride bikes then it will remain a minority pursuit no matter how enthusiastic that minority might be. In order to achieve true mass cycling this must be a means of transport attractive to the whole population. Read also a three day later blog post about the wide cycling demographic of the Netherlands. A week after this blog post was published, Mark Wagenbuur made a video based upon this post. Several other blog posts detail what brought this level of cycling about. Key to it all is of course a high degree of subjective safety and making cycling into a convenient mode of transport. I think our stats in Australia would be the opposite. Most of our cycling would be on weekends by sports cyclist or short rides by families on cheap K-Mart mountain bikes. Very few people cycle to work or school. On my 6km commute to the train station I might see 2 or 3 sports cyclists in the morning but generally don't see any cyclists in the evening. This is in an area with 'reasonable' infrastructure, great weather conditions & low traffic volumes. The only reason I can think of for the lack of cycling is the car & sports cultures that Australia has nurtured where cycling is considered a fitness activity & therefore doesn't even register as a mode of transport. "Treating the country as a 'city,' the people here are spread out at a remarkably low density of just 400 per square kilometre, vs. 4800 per square kilometre in London or 10000 people per square kilometre in New York." I've been working on a similar argument for Los Angeles County, which has a density of about 940 per km2. We've about one-half the Netherlands' population squeezed into one-fourth the land mass. What happened to the wide-open spaces of the wild west? "What happened to the wide-open spaces of the wild west?" With regards to LA; cowboy movies. Oh, the irony. I'd point out, however, that the real Dodge City is in Kansas. The coastlines are always where the really big cities will form. Even in the heartland, Chicago is on a coastline. Those big cities that are not on coastlines are connected to them by big rivers. The Netherlands were formed from coastline, just ask the Zuiderzee about that. If you want wide open spaces you go to out to sea or to inland plains, not to coastlines.